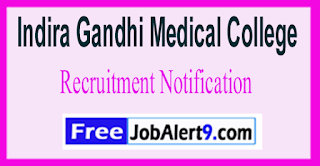 IGMC (Indira Gandhi Medical College) Has Released Recruitment Notification For 11 Data Entry Operator, Field Worker Posts. 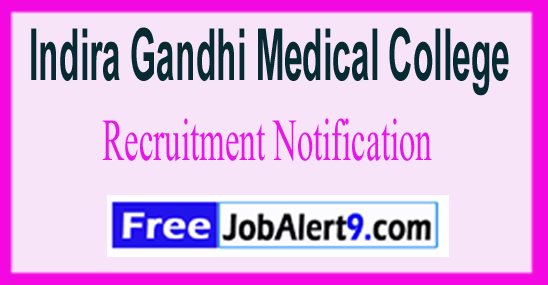 All Eligible And Interested Candidates Can Attend Walkin Interview .Further Detailed Information Regarding Educational Qualifications, Age Limit, Selection Procedure, Exam Pattern, Syllabus for IGMC (Indira Gandhi Medical College) Recruitment 2017 - 11 Data Entry Operator, Field Worker Post is mentioned below. Candidates age should be between 18 to 45 Years (Post 1,4-6), 18 to 30 Years (Post 2), 18 to 28 Years (Post 3). Candidates should have done 10th / 12th / Graduation Degree / Master Degree or its equivalent qualification from A recognized university. Rs. 16,560/- (Post 1), Rs. 27,397/- (Post 2), Rs. 16,179/- (Post 3), Rs. 19,800/- (Post 4), Rs. 53,680/- (Post 5), Rs. 15,000/- (Post 6) . All Eligible & Interested candidates are required to attend walkin inter-view a long with relevant testimonials to the following Address on (8th June 2017). Conference Room, Indira Gandhi Medical College, Shimla . Date for the Walk In Interview - 08-06-2017. Click Here For IGMC Recruitment 2017,Advertisement.